People travel to wonder at the highest of mountains, at the huge waves of the sea, at the long courses of rivers, at the vast compass of the ocean, at the circular motion of the stars; and they pass by themselves without wondering. Through publication of his visionary books Earth Ascending and The Mayan Factor, both released prior to Harmonic Convergence, Jose' Arguelles brought worldwide attention to the depth and complexity of what had previously been a highly shrouded Mayan cosmology. His books laid bare the underlying principles of the Tzolkin, most sacred of a host of Mayan calendars. Especially important to me was that Arguelles clearly invoked the universal applicability of the core principles animating the Tzolkin. For, since 1986, I have myself embraced the universality of the Tzolkin and have applied it in a novel way to the transformation of my own consciousness. In the following pages I will reveal how, by combining the Tzolkin and the synodic cycle of the Moon, I crafted a path of collective astrological attunement I call The Lightning Path. Although initially formulated from simply the Tzolkin and the lunation cycle, The Lightning Path has since come to comprise the chakras and the I Ching as well. In turn, it has become much more universally applicable. Clearly, it is not meant for me alone and this is why I have created this website as a giveaway to all who seek to embrace this form of consciousness expansion. I use the distinguishing term Lightning Path because I believe it is important not to confuse this contemporary and non-traditional use of the calendar with the ongoing and important work of contemporary Mayan day keepers. To them and to their forebears, I humbly offer my deepest gratitude and respect for keeping this flame of sacred knowledge alive for generation upon generation. I also use the term Lightning Path because, as I will show below, it links the synodic cycle of the Moon to the orbit of Uranus, Uranus being the astrological significator of awakening and transformation. 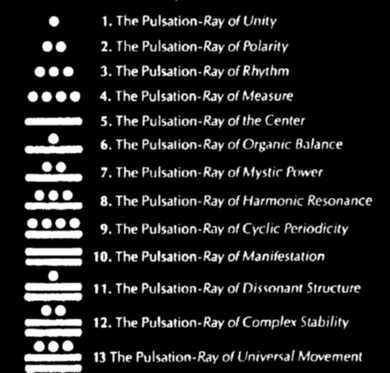 A basic building block of The Lightning Path is the Tzolkin, a universal spiritual tool combining 20 sacred hieroglyphs with 13 sacred numbers, as shown in the diagram below. Each combination of Tzolkin number and glyph represents a code of transformation, one stage in a 260-stage process, the purpose of which is the development of cosmic consciousness and unconditional love (AHAU) amongst practitioners. As potent symbolic representations of the many states of awareness encountered on such a quest, these 260 combinations of number and hieroglyph encompass the whole gamut of human experience, from the simplest to the most complex. Application of these codes to our own lives enables us to gradually shift our awareness from the realm of the purely personal, to that of the broadly trans-personal. Everything is in it that pertains to being, not only as progressions of the light but as a ladder to be ascended by hero and heroine alike. The twenty Signs in their ever-revolving order define a path of life in which the physical being prepares and is a stage for the higher mental spirals of being. It is a path of being that is total and inclusive of human being, a path and a pattern of being that is universal, not merely of this life on this planet but for all life throughout the universe. In their glyphic, iconic, comic-book simplicity, the twenty Signs describe the destinal adventure as the Mayan navigators have successfully charted it in their light-crafted explorations of the galactic field. Application of the Tzolkin codes to my own life began in 1985 when I read the book Earth Ascending by Jose’ Arguelles. 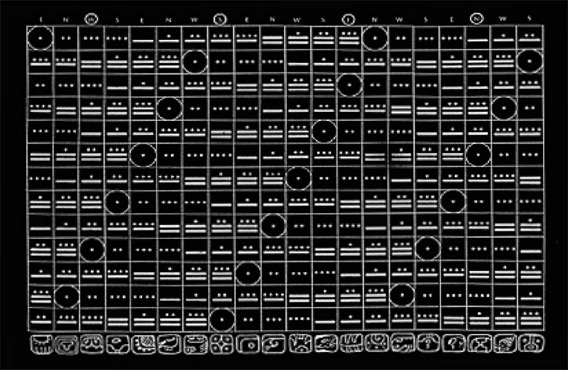 In that book, Arguelles indicated that what is generally referred to as the Mayan Sacred Calendar, or Tzolkin, is a constellation of fundamental principles that can be applied at any scale we choose, not simply at the scale traditionally used, wherein it repeats itself every 260 days. In other words, the calendar is what mathematicians term "fractal." This means that it retains a consistent structure, no matter what scale it is applied at and it was my understanding of this fractal nature of the Tzolkin that set the stage for what, in March of 1986, began my unconventional use of it that has resulted in what I now call The Lightning Path. For thirteen years previous, I had sustained a Moon cycle attunement practice that put me in touch with the changing phases of the Moon on a day-to-day basis. 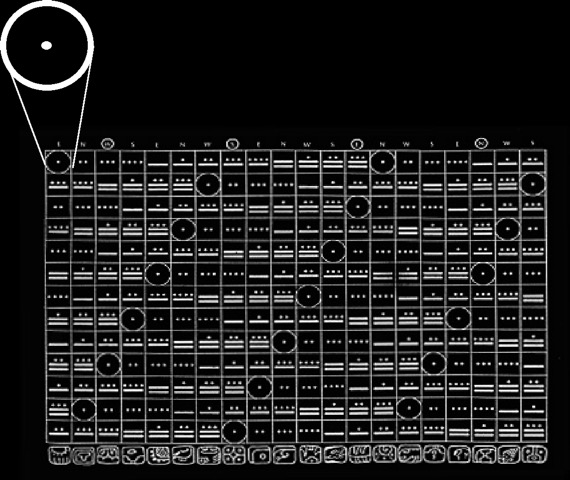 Then, on March 3, 1986, in an unexpected moment of insight, I saw that it was possible to relate to the Tzolkin, not as a grid of 260 days, as is its conventional use, but rather, as a grid of 260 Moon cycles spanning approximately 21 years. Now, more than two decades since beginning that use, I understand each 21 year period as one of four "Uranian seasons" since 21 years is exactly one quarter of the time it takes Uranus to orbit the Sun! It thus seems clear to me that, within this close integration of Tzolkin, Moon cycles and orbit of Uranus, Uranus plays a significant co-ordinating role. So, let us look to historical Uranus for a deeper understanding of what it represents and perhaps this will shed light on what the Lightning Path is all about. Astrologically, Uranus has long been associated with all things revolutionary and unexpected. The planet was discovered by English astronomer William Herschel in 1781 only after the invention of the telescope made it visible. Previously, only the planets from Mercury out to Saturn had been visible and constituted the known solar system. Saturn was associated with all that is visible to the naked eye and thus became the astrological significator of the status quo. The discovery of Uranus, however, disrupted the status quo and thus became associated with whatever shatters convention, whether through invention, revolution or transcendence. 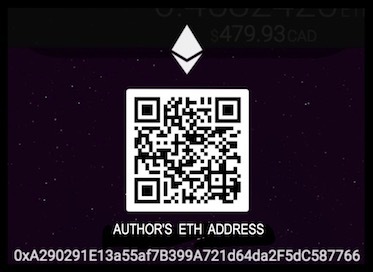 Most generally, it became known as the "Great Awakener", and remains so to this day. My conscious realization that Uranus was involved in the integration of Tzolkin and lunation cycles came only after many years of devoted lunation cycle/Tzolkin attunement on my part. 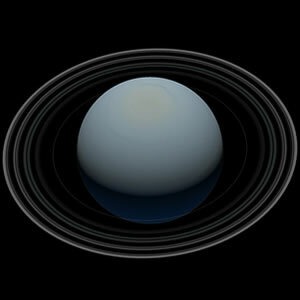 Nonetheless, the influence of Uranus had been with me since 1970 when, at the age of 21 years, I had an unexpected and overwhelming visionary encounter with a spiritual presence I perceived of simply as white light. That experience, which came to me in a moment of deep despair and angst, immediately repolarized my psyche and catapulted me onto a spiritual quest that, for years, guided me into research of particular kinds of information I felt intuitively were related to my encounter. This website reveals the wide-ranging scope of my research and in its totality constitutes the most current consolidation of the intellectual results of my quest. 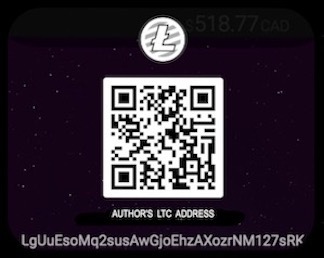 It portrays as best I have been able to explain it, just what the Lightning Path is all about. The Lightning Path fosters the emergence of a new, universal human. As a revolutionary spiritual practice grounded in some of the most ancient and enduring symbolic systems of humanity, it facilitates the expansion of human awareness beyond the confines of the Status Quo by supporting its practitioners as creative, self-empowered individuals, each with his or her own unique destiny. In speaking of the Lightning Path as revolutionary, I come from a notion of peaceful revolution that inspired me in my early twenties. It was during that time that i encountered a book edited by Ivan Illich titled De-Schooling, De-Conditioning wherein was included an article by a young Jose Arguelles titled An Organic Revolutionary’s Handbook (1972). Remarkably, without directly refering to any kind of lunation attunement, that article described precisely what I had come to understand the meaning and purpose of that attunement to be. Understand that this change is part of the process of another cosmic Initiation. What is a volute ? a turn of natural force. Where does a volute come from? 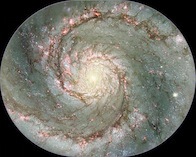 The center of another volute. Thus Re-volution is the process of going from one (exhausted) manifestation of the will, to a new manifestation of the will. to the center of the life-force, which is essential being--simply being. It is to become simple again, unburdened by the weight of the previous manifestation of the will. Thus Revolution is Life Renewed. To reach the New, leave the Old. The most crux-ial process in Re-volution is cruxifixion. The most thorough revolutionary is by nature an alchemist. The true Revolutionary is a Seed of the New. In being a Seed, he fulfills the purpose of Organic Revolution. Upon encountering these words, I began to see that my choice to develop and sustain a daily practice of lunation cycle attunement put me squarely on the path of the organic revolutionary. It was clear to me from the outset that each lunation cycle constituted a volute and that by simply, yet consciously attuning to the constantly changing phases of the Moons, I would naturally and rhythmically undergo the process of self-renewal central to the life of the organic revolutionary. (See LP Timebeam for current tracking of Moon cycles). Over the many years since first choosing this path, it has become abundantly clear to me that conscious attunement to the phases of the Moon can help facilitate a balanced deployment of the personal will. By understanding the inner structure of the lunation cycle one can anticipate its various phases of unfoldment and can adjust one’s actions accordingly. Such adjustments are especially helpful in grounding and sustaining any spiritual practice on a day-to-day basis. Ideally, lunation attunement brings both masculine (Sun) and feminine (Moon) sides of one’s nature into balance and harmony. Over my thirteen years of lunation attunement prior to the Tzolkin entering the picture, I divined meaning for each lunation by determining where its New Moon fell in the astrological zodiac. However, as introduced above, in March of 1986 I began to see how those same Moon cycles were embedded into the warp and woof of the Tzolkin. This opened up a whole new realm of meaning for me and from that time since, I have related to the Tzolkin, not at the scale of one day per sector, as done in the traditional calendar count, but rather, at the expanded scale of one lunation cycle (29.5 days) per sector. 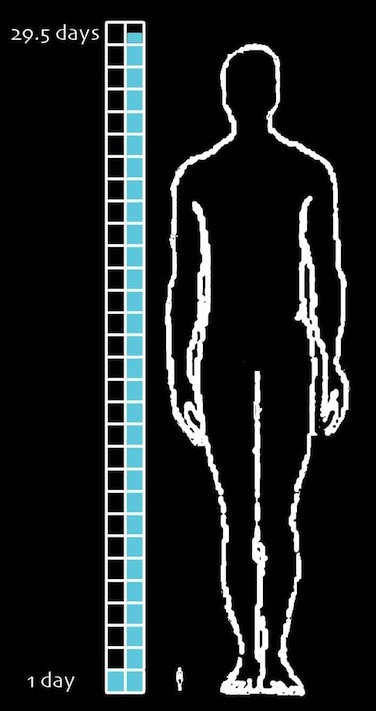 This is illustrated in the following diagram where two human figures are used to represent the considerable difference in scale. Relative Scale: Traditional Tzolkin vs. Lightning Path. Tzolkin Unit = 1 day Lightning Path Unit = 1 lunation = 29.5 days. 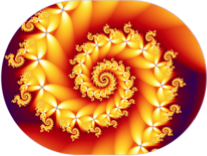 Such variation in scale of use of the Tzolkin is possible because it is mathematically fractal in nature. This means it retains the integrity of its structure at ALL scales of application. Fractals. Click either image for more information. Although one can theoretically enter the Tzolkin at virtually any sector of its 260 unit grid, my entry upon The Lightning Path in March 1986 began at sector ONE IMIX, as indicated in the upper left hand corner of the diagram below. At every New Moon since that time, I have consciously entered subsequent sectors of the Tzolkin according to the natural progression mapped by The Lightning Path. Attuned to the dynamically unfolding inner structure of each lunation cycle, I have voluted and re-voluted my way deeper and deeper into the mystery of my own becoming. A partial record of this journey is what is contained in The Lightning Path Timebeam. Lunation Planning is a natural, organic time-management system based on the 29.5-day Lunation Cycle, the ever-changing cyclic relationship between the Sun and the Moon. Everyone, in their own way, naturally feels and performs better when they tune-in to its rhythm. When guided by this natural cycle, our projects and endeavors — be they long-term or short-term, acted out by an individual or by a group — are more successful and rewarding. Lunation Planning is the oldest time-management tool. Lunation Planning is universal, it is deeply rooted in all cultures and religions. It is the foundation of virtually all ancient calendars, including the Hebrew and the Chinese calendars. 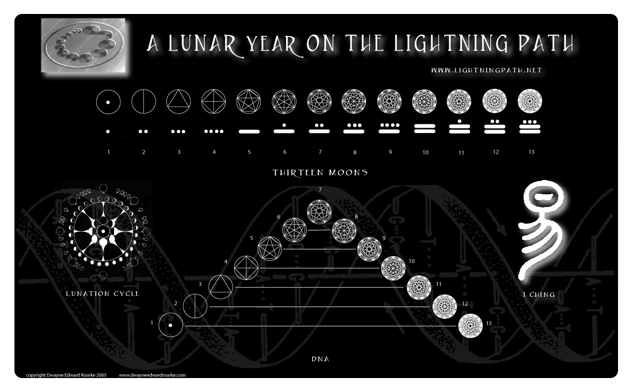 The Lightning Path as Matrix of 260 Lunar Cycles. Throughout my journey, the Tzolkin has acted as a symbolic backdrop, and, as I will share in more detail in following chapters and in my Lightning Path Timeline entries, this sensitized my psyche to a broad range of synchronous experiences that united my material world and my spiritual world, as one. For an extended period of time a transcendental force guided my every act, all the more so as I picked up on synchronicities between my personal experience and the transpersonal symbolism of the Tzolkin. My life became infused with meaning as I began to understand the twenty sacred hierogyphs and thirteen sacred numbers associated with the Tzolkin. I found that the more familiar I became with these elements, the more I understood the complex web of meaning that is the Tzolkin. The thirteen sacred numbers used on The Lightning Path are the same numbers used in the traditional Tzolkin calendar. They are indicated below using the traditional system of dots and bars where a single dot represents one and a bar represents five. (The terminology shown here is from Earth Ascending by Jose Arguelles). These numbers combine with the twenty sacred hieroglyphs of the Tzolkin to create 260 codes of transformation of consciousness applicable across the full spectrum of human experience. The Lightning Path does not alter the essential meaning of the Tzolkin numbers or glyphs. It simply applies them at an expanded scale, thereby revealing realms of consciousness not necessarily made apparent through traditional use of the Tzolkin. Dragon, alligator, primal trust, source of life, Primordial Mother, physical protection, undivided primal waters, divine nurturance and support. Wind, truth, spirit, breath, inspiration, co-creation, clairvoyance, unseen forces, communication, creative genius, integration of polarities, one's calling and purpose in life. Lovers, desire, choice, passion, instinct, intimacy, invention, kundalini, solar energy, sexual energy, psychic bonding, tempering of vices, serpent. Crying, release, victory, warrior, triumph, humility, mourning, catharsis, surrender, revelation, forgiveness, transmutation. Gifts, body, ritual, feasts, mudra, mating, charity, courtship, endurance, hospitality, completion, spontaneity, acting "as if", spiritual tools, ceremony of the dance, deer. Barter, wisdom, starseed, maturity, ripeness, the sage, the octave, wayshower, negotiations, expanded love, clear perspective, beneficial combinations rabbit. Signs, signals, godseed, psychometry, surging forward, self-remembrance, psychic wholeness, passage through life, cosmic communication, beacon of consciousness, reaping the rewards of effort. Path, friends, balance, dream weaver, total immersion, spiritual strength, recasting the past, guardians and guides, companions of destiny, emotional-body issues, fulfillment of wishes, dog. Mask, clans, humor, theatre, disguise, reversal, artistry, amusement, disruption, spontaneity, Hanged Man (tarot), transparency, ethnic groups, entertainment, apprenticeship, tribal meetings, trickster, monkey. Harvest, renewal, analysis, abundance, quickening, open vessel, empowerment, mind as friend, self-nurturance, getting to the point, grass, open mind, cornucopia, chalice. Teaching, knowledge, understanding, time/space travel, angelic messenger, fluid reference points, balancing of opposites, courage and compassion, working in harmony with others, pillars of Heaven and Earth uniting, reed. Priest, jaguar, shaman, integrity, magician, messenger, meditation, night seer, torch bearer, heart-knowing. Hope, leadership, inheritances, management, commitment, understanding, planetary mind, spiritual power, belief in oneself, gathering of eagles, dreams and visions, gods and goddesses, global consciousness, compassionate service, liberty. Aid, care, trust, status, inner voice, mystic staff, distinctions, golden pillar, galactic conduit, divine ferryman, eddies, mystic transmission, cosmic consciousness. Timing, synergy, territory, deadlines, scheduling, earthquake, earth force, earth keeper, synchronicity, body knowing, crystal healing. Action, detail, clarity, success, hierarchy, fruitfulnes, facing shadow, making choices, spiritual warriorship, integration of paradox, designation of priorities, division of land holdings, incense. Storm, rain, emotion, feelings, cleansing, telepathy, sensitivity, light body, purification, thunder beings, transformation, renewed energy, ecstatic freedom, impressionability, sensitivity, keys to all worlds. Sun, union, teamwork, wholeness, ascension, attainment, fulfillment, world peace, unconditional love, Christ consciousness, oneness with divinity, language of light. See artistic interpretations of each glyph here.